Patience: A Lesson In Joy: If Christmas isn't found in your heart, you won't find it under a tree. 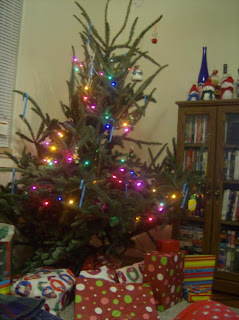 Yesterday, Tom and I found ourselves buying a discount, thus defective Christmas tree. There were maybe eight left in the lot, and this was the smallest, leaning up against the brick wall, gangly and constantly overlooked. Perhaps it wasn't loved because it doesn't taper towards the top, or perhaps it wasn't big enough for a family's full arsenal of ornaments. Maybe after a twirl, others realized that one full side is flattened, after weeks slumping into wall for support. But we love it, as special as it is. We have all of ten ornaments, one lone string of lights, plus some candy canes. It fits perfectly (both in size and in theme - the theme being defective) into our little humble apartment. It's our second Christmas tree as a family, and the first solely decorated with the ornaments we have collected in our first year and a half of marriage.